"Mooching for salmon" might just rank up there with "noodling for catfish." It definitely has a funny ring to it, and really doesn't have anything to do with what most people think of mooching as-- at least not anymore. Whether my Seattle Senior Citizen sources are right or not, I'm not sure, but I'll relay the story anyway. 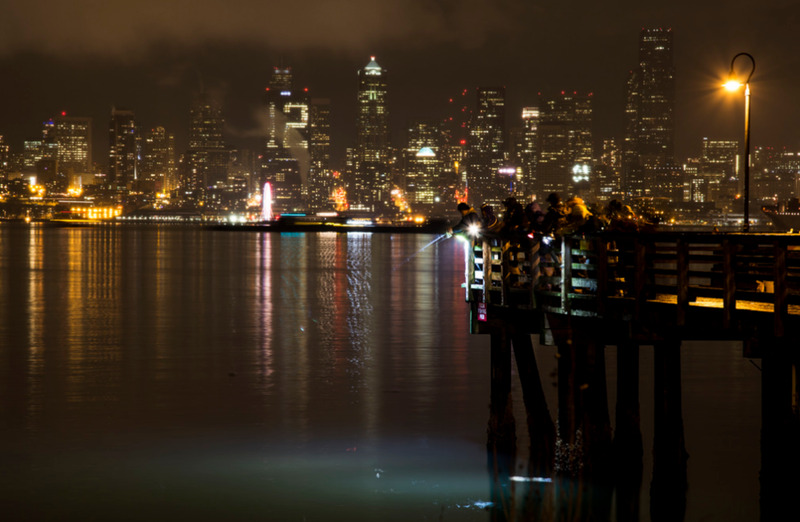 Apparently a long time ago, in the Seattle area, plugs were the go-to lure of all salmon fisherman. Then along came some pioneering fishermen who started using dead herring as salmon bait. 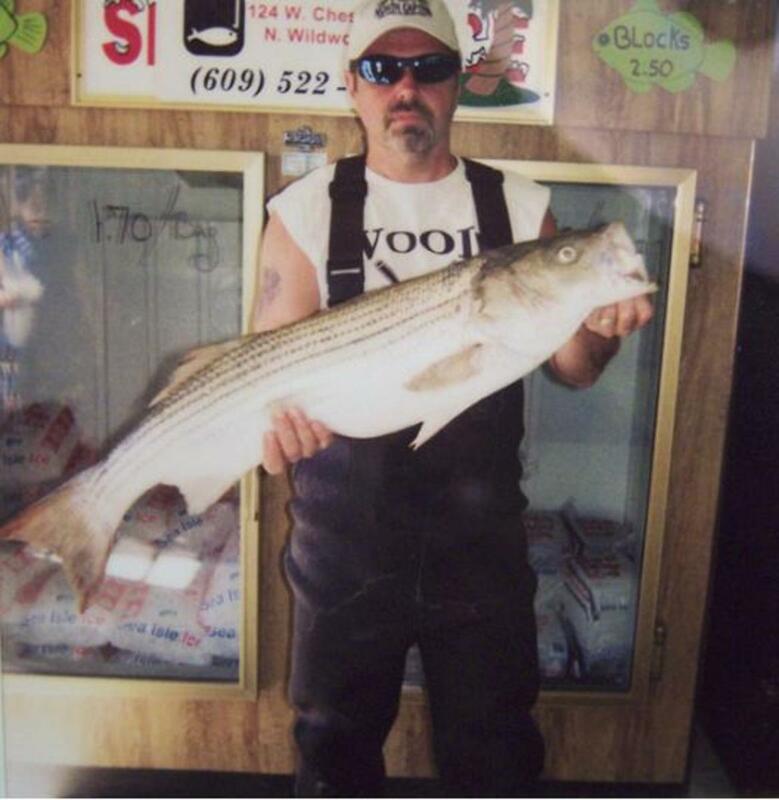 These fishermen continuously brought impressive catches back to the docks, instilling jealously in the plug fishermen. Not wanting to be outdone, these plug fishermen started asking, or "mooching," for the bait fishermen's leftover herring at the docks, so that they too could go out and slay salmon. Seems like a viable story, but who knows. 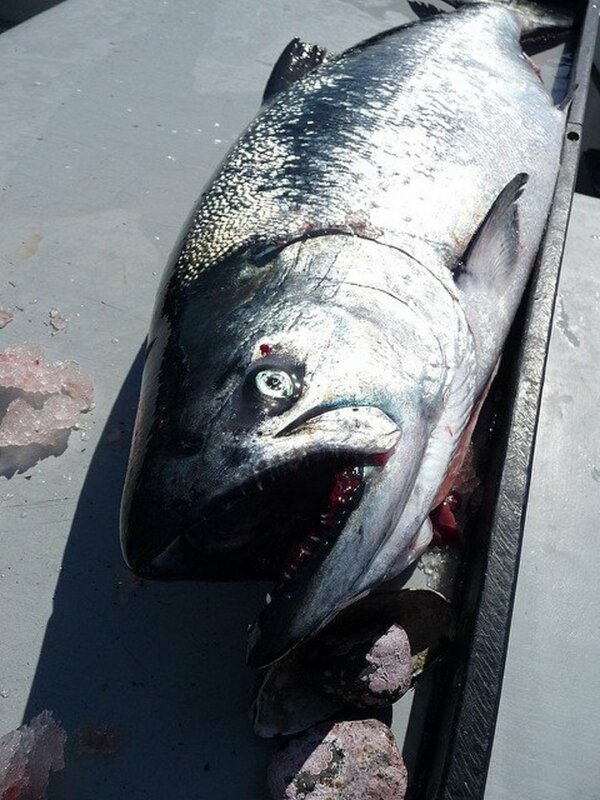 Regardless, the salmon fishing tactic that is now know as mooching is a proven strategy for catching salmon. 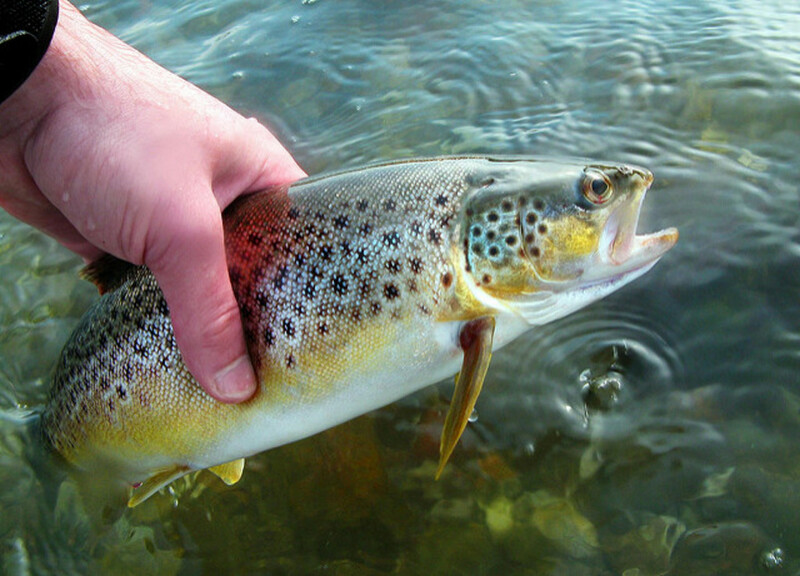 It requires minimal tackle, can be done from nearly any type of craft, and best of all, catches fish. Now lets get you set up go catch some salmon! Mooching can be done with nearly any salmon-capable rod and reel, so if you are new to mooching but already have a salmon set up, just use what you already have. 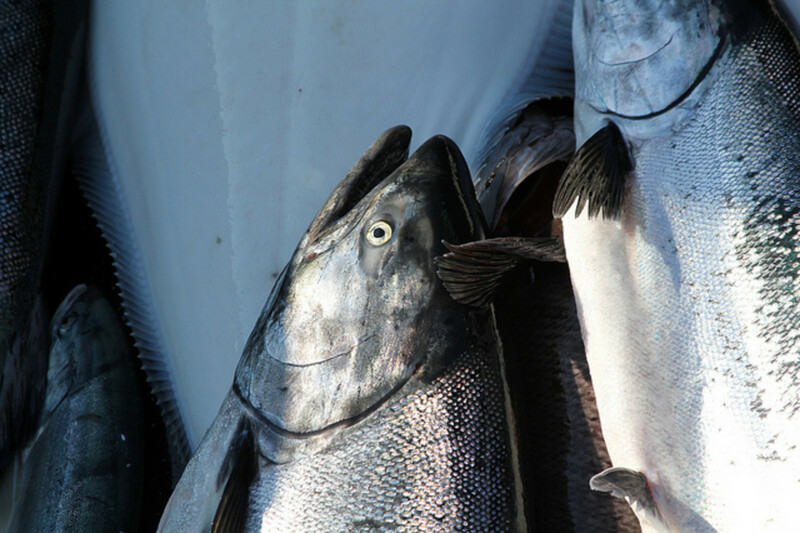 Otherwise, here are some quick pointers to get you a solid salmon mooching set up. There is a special type of reel called a mooching reel, which looks more like a giant fly reel, but the nice ones are quite expensive and serve a limited number of purposes, so for now, I would stay away. If for whatever reason you feel inspired, treat yourself to an Islander brand mooching reel, you won't be disappointed. There really is not too much to worry about on this one. Traditionally a 9 to 10' medium action rod will do here. So choices abound, its really up to you. The only time I would suggest a braided line is if fishing especially deep, or in a particularly strong current (the thinner diameter line will allow you to use less weight). Mooching is a rather simple technique, but there are a few points that should not be overlooked. One of those is swivels. A good swivel will either make or break a day of salmon fishing. While you have hundreds of choices for swivels, only two will work here. Bead chains, or ball bearing swivels. Bead chains are a series of barrel swivels linked together. Each individual bead still tends to bind somewhat under load, however there a usually 6 or 7 of them, so generally line twist is eliminated. Your other option is ball bearing swivels. They have cheap ones, but don't be tempted, stick with Sampo ball bearing swivels. Most charter captains I've worked with who use mooching on their boat choose bead chains. The Shimano Tekota has the line capacity, drag stack, and durability to handle big salmon. The additional line counter is incredibly helpful for accurately managing mooching depth drift after drift. A salmon mooching rig. The crescent sinker shown can be substituted with a sinker slide and cannonball sinker. There are two styles of sinkers available for mooching: crescent and cannonball. Crescent sinkers are nice in that they keep the entire rig in-line, won't move up and down your mainline. However, a heavier crescent sinker is needed to sink your bait as they tend to plane and swim around in the water due to their shape. Cannonball sinkers, which will be attached to a sinker slide above your swivel, add a small degree of complexity, but can be a smaller weight than the crescent sinker. Again the choice is yours, but I prefer cannonballs on sinker slides. Weight-wise you're looking between 4 and 8 oz, which all depends on depth, current condition, size of herring, type of sinker, etc. Keep a few different sizes on board to account for any changes. There are few times when I will recommend using a pre-tied leader for fishing. This is one time when it's okay. 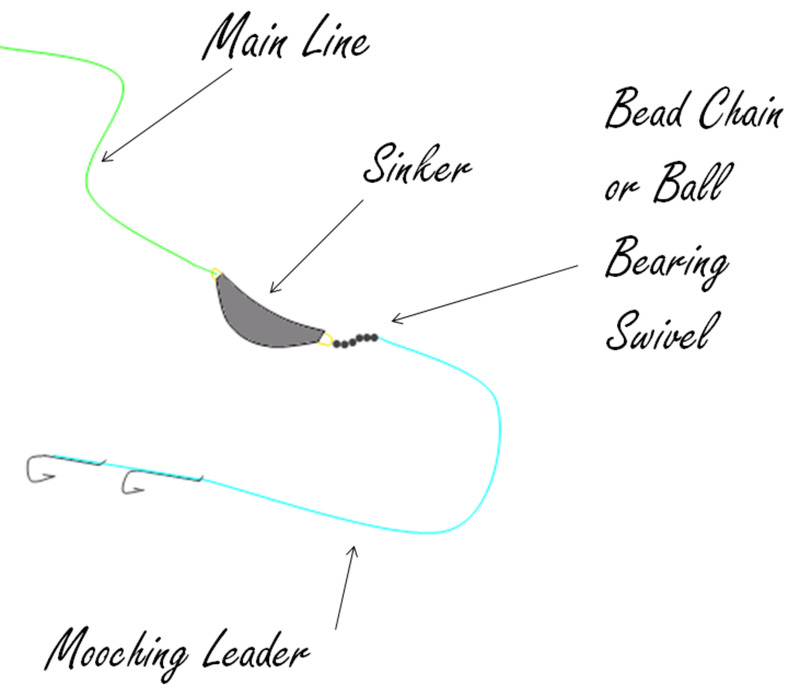 Ideally, you would tie your own as this would allow you to select the line type, line weight, hook brand, hook size, hook style, knot style, hook spacing, and hook orientation, but you will need a lot of these, and until you become adept at tying mooching leaders, they do take some time. So long as you buy quality pre-tied leaders, it shouldn't be an issue (most guides will use pre-tied). A mooching leader consists of a leader line, with two hooks tied at the end. The last hook is always hard tied, with the forward hook either hard tied or slip tied. Slip tied hooks allow adjustment which can be convenient. The downfall here is that you are at a significant disadvantage when setting the hook with a sliding hook. For this reason alone, I strongly encourage you to use fixed-fixed leaders. All pre-tied leaders will specify if they are fixed (sometimes called solid) or slip rigs. 25 to 30 lb test monofilament (If you tie your own, feel free to splurge and use fluorocarbon leader material). In some ares, barbless hooks are required, so check your local regulations. Either pinch the barbs down (and really pinch them well), or buy barbless hooks. If buying, stick to reputable brands: Gamakatsu, Owner, etc. Remember, your're betting your fish on their knots. 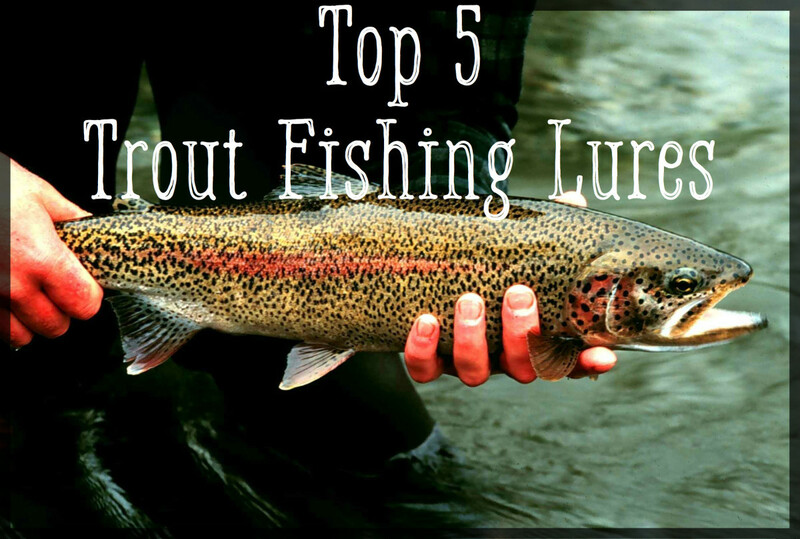 Depending on how long you will be fishing, I would suggest at least 6 or 7 spare leaders per rod, as any time a salmon is hooked, the line snags bottom, a dogfish is hooked, the line becomes seriously twisted, or any other event that could compromise the leaders strength, you should tie on a new leader. Don't be tempted to fish with a chipped or knotted leader, you will likely lose your next fish. So, do that math, and you might realize why buying pre-tied leaders might make sense. So as far as gear goes, that's all there is. Terminal tackle here is cheap. Pretty cool right? The bait here is herring. There are two way to go about procuring herring: the bait shop, and the ocean. Most salmon fishermen simply buy their herring. When purchasing herring, check for freshness. Things to look for are a clear eye and intact scales. Herring that were frozen immediately will hold together better on the hooks. Keep them frozen until you plan on using them. Many anglers will soak the herring in a chilled water and rock salt brine before using them, as this will toughen up the herring. Additionally, other scents and colors can be added to the brine to make the herring stand out. Personally, I prefer natural looking herring, but I know plenty that swear by dyed blue or green herring (not to be confused with blue or green label herring). Finally, make sure to keep the herring cold when stored on the boat the day of. The best ways to guarantee freshness is to pick up a couple sabiki rigs and catch your own. The idea here is to get the herring to spin in the water. There are a few options here, but I'll just cover the two most common: plug-cutting, and bending the herring. Plug-cutting: Here the head of the herring is cut off at a compound angle. You want to cut at roughly a 45 degree angle along both axes, so the spine of the cut fish is slightly longer than the belly, and also so that one side of the fish is longer than the other. Its complicated to explain, so watch the video if you like. The herring is then hooked with the forward hook through the spine, and the trailing hook often left to dangle. Bent herring: Here a whole herring is used. The forward hook is set through the lower jaw of the herring, and passed through the upper part of the mouth as to keep the mouth shut. 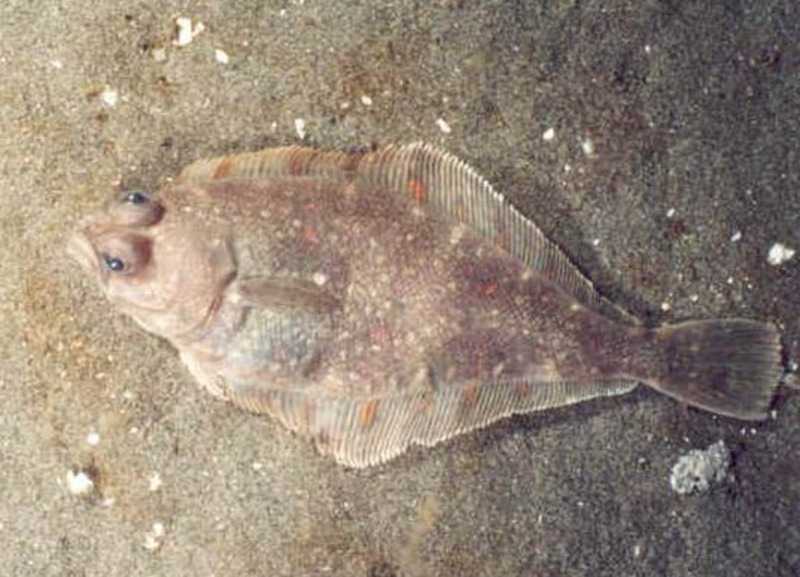 The trailing hook is hooked though the tail of the herring to hold the herring in a slight bow shape. The degree of bend will control the roll of the herring. Both methods have been proven effective, and have advantages, so the choice is yours here. Finally, mooching technique. Mooching relies heavily on covering the vertical water column. This can be accomplished one of two ways: Motor mooching, and Drift mooching. Motor Mooching: Here, the mooching rigs are lowered to the bottom depth you plan on fishing (I wouldn't suggest the bottom and other fish will harass your bait.) Once the rigs are in position, the rods are set in the rod holders, the boat is put in gear, and slowly motored forward just fast enough to get the rigs to rise in the water column back behind the boat. Once the rigs have been pulled close to the surface (due to the force from the water) the boat is put in idle, allowing the rigs to sink back down. This is repeated until you catch fish. 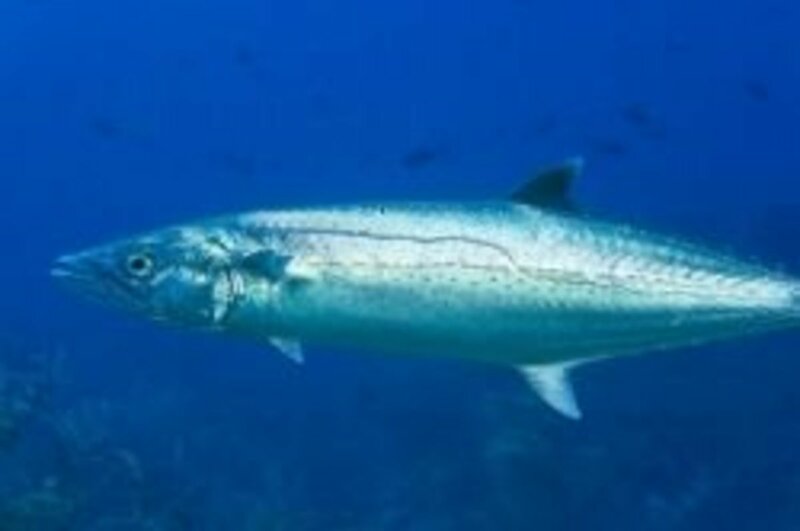 So again, the choice is up to you, but if the anglers on the boat are up for actively fishing, I strongly recommend drift mooching--- it will almost always catch more fish, and I think its more fun. So there you go, you're a Salmon Mooching Expert now! Now just get out there and rip some lip! Get back to me with any questions, pictures, or advice! 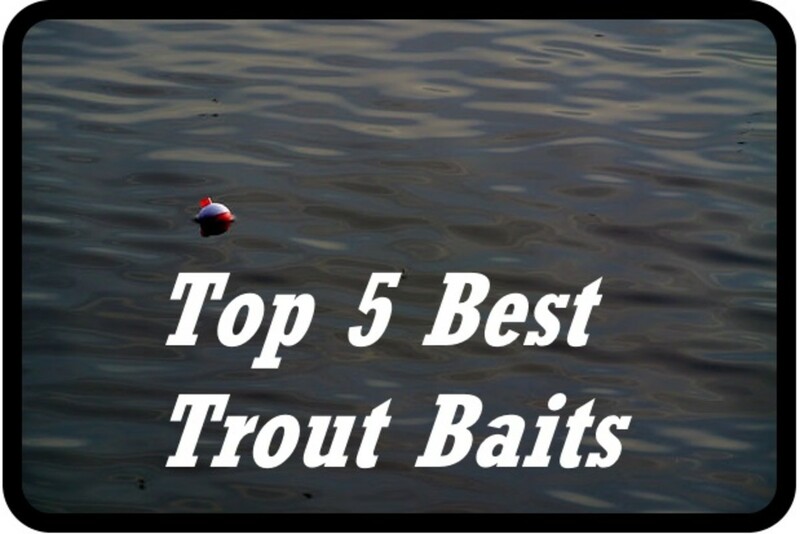 I am using these methods to catch Lake trout and it is working famously. I started by getting my local bait shop to give me his dead suckers (what a mooch) salted them and froze them until needed. I don't have a downrigger but do have heavy sinkers and a line counter reel so "watch out trout". Thanks Lastheart! Wish him luck on the water for me! Very good hub. My nephew will love this information.